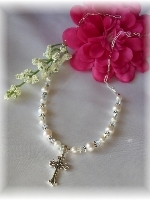 Beautiful sterling silver and pearl Cross Ring to complement any First Communion dress! Also great for flower girls! This beautiful little sterling silver ring, adorned with tiny pearls in the form of a sideways cross is the perfect complement to any First Communion dress! Perfectly sized to fit most girls ages 6-10 at ring size 5. 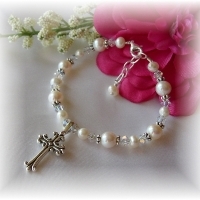 * (see below for important sizing information) Cross measures approximately 20mmx10mm.